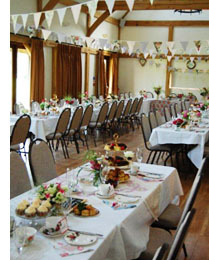 I specialise in all manner of functions from traditional Wedding Receptions to funeral teas to a simple buffet. Hog roasts and BBQ's are available. I offer a friendly tailor-made service offering bespoke menus for your special occasion. Each menu can be tailored for your individual needs whether it be a budget or number of guests. Supplying you with all your needs for the occasion, contemporary white china perfect to compliment any colour scheme. Vintage china for that afternoon tea. Quality Dewsbury design cutlery, glassware and white table linen. I rarely cater for less than thirty people because the economics do not make for a realistic price to either party. All menu prices are based on travelling within a 15 mile radius of Bury St Edmunds, further afield may incur a small charge. I'm here to help you with contacts for outside bars, florists, disco's etc.